The blog of former Marvel editor Jim Shooter has become a wealth of absolutely crazy stories as of late (see: the origins of Secret Wars, the script for the Dazzler movie), but this latest anecdote takes the cake. According to Shooter, Marvel almost licensed the publishing rights for every single DC character. Bill said, more or less, that Marvel seemed to be able to turn a substantial profit on publishing comics, as opposed to DC, which consistently lost money, a lot of money, and had for a long time. On the other hand, LCA (Licensing Corporation of America), Warner's licensing arm did very well with the DC properties, while Marvel "didn't seem to do much licensing." I told him I thought Marvel would be very interested, and that I would discuss it with Marvel's President, Jim Galton. So, I did. I told Galton about my conversation with Sarnoff. Galton said he'd give Sarnoff a call. The next day, I went upstairs, poked my head into Galton's office and asked whether he'd called Sarnoff and, if so, how that went? Galton said he told Sarnoff we weren't interested. Galton said-and this is prima facie evidence of the fact that he missed Comic Books 101 in publishing school-since DC books weren't selling, "those characters must not be any good." I think it's safe to say that when you're being sued under anti-trust laws, it's a bad time to devour your largest competitor. On the other hand, there is the "we-have-a-clue-and-they-don't" or "superior acumen" defense. We considered arguing that defense and pressing on with the deal. It's unclear if the Marvel and DC universe would have eventually intertwined like when DC acquired former Charlton Comics characters (Blue Beetle, The Question, etc.). But gee-whiz! The possibilities here were somewhat staggering. In an alternate universe, there's a Frank Miller Dark Knight/Daredevil series floating around. 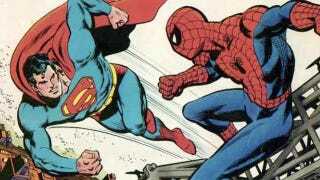 Top image: 1976's (totally unrelated) Superman vs. the Amazing Spider-Man.